I haven’t made pesto in so long and I loved the idea of using arugula instead of basil! 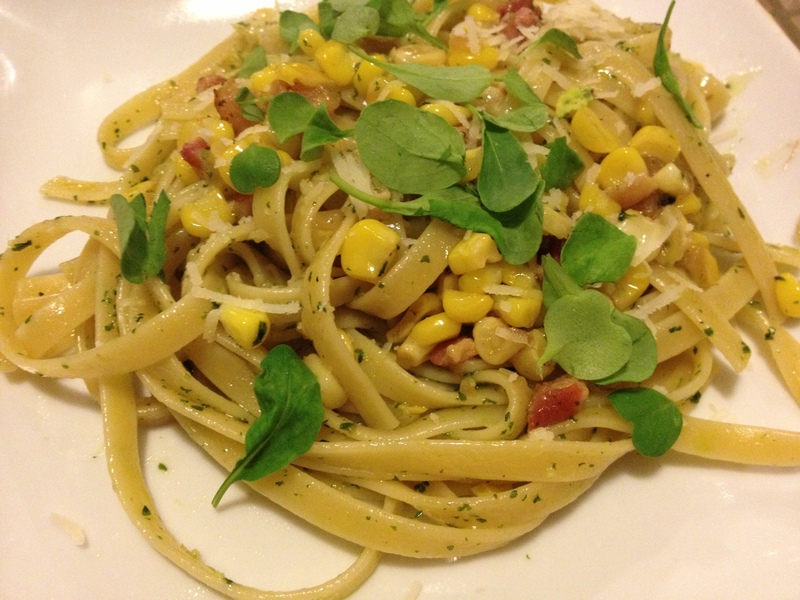 This is a quick pasta dish with lots of elegance! 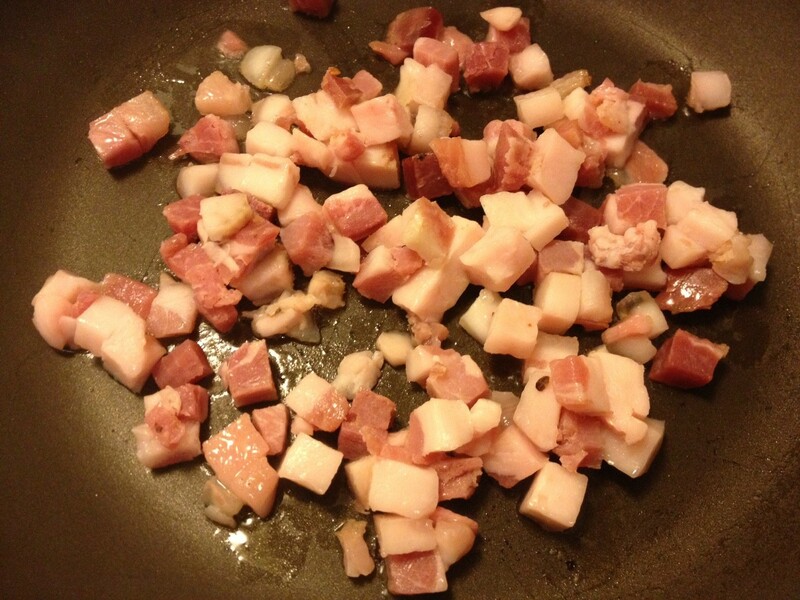 The pancetta is delicious but if you don’t eat pork, or don’t eat meat altogether, just eliminate it. The flavor is still great! First things first, start your water boiling for the pasta. In a smaller pot, boil water to blanch your arugula. Once the water starts boiling, add your two cups of arugula and cook for 30 seconds. 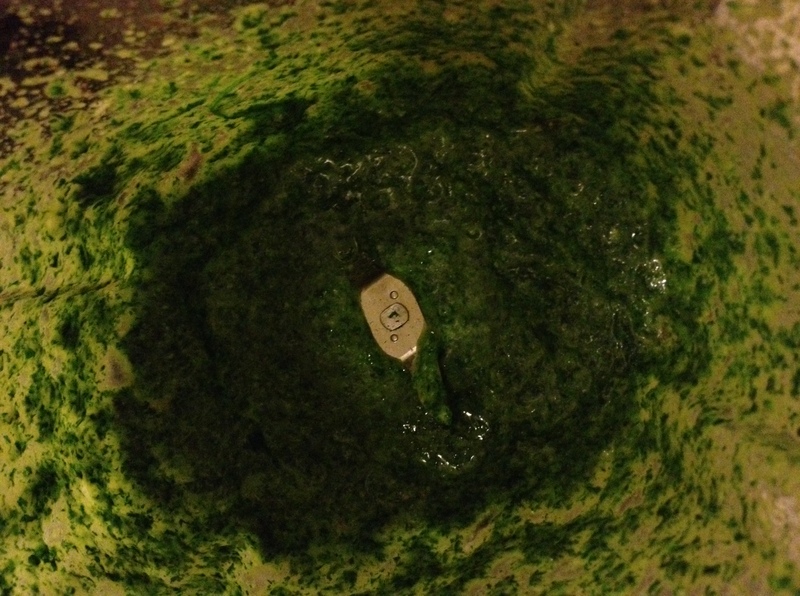 Drain, rinse under cold water, and squeeze out any excess liquid. 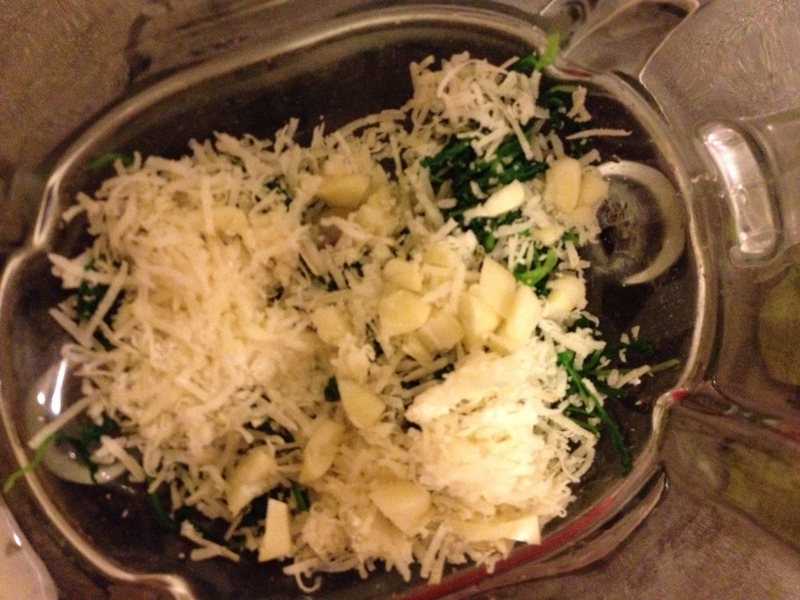 Add the arugula, Parmesan, 3 cloves garlic and 2 tsp of lemon juice to a blender. Pulse the blender to mix. The mixture may be on the thick side, so use a spatula to scrape the sides of the blender. Put the blender on low and slowly add the olive oil. Keep an eye on the pasta water. Once it starts boiling, add the pasta and cook until al dente. Once you start cooking the pasta, heat a drizzle of olive oil in a saute pan. Add the pancetta and cook for 5 minutes. 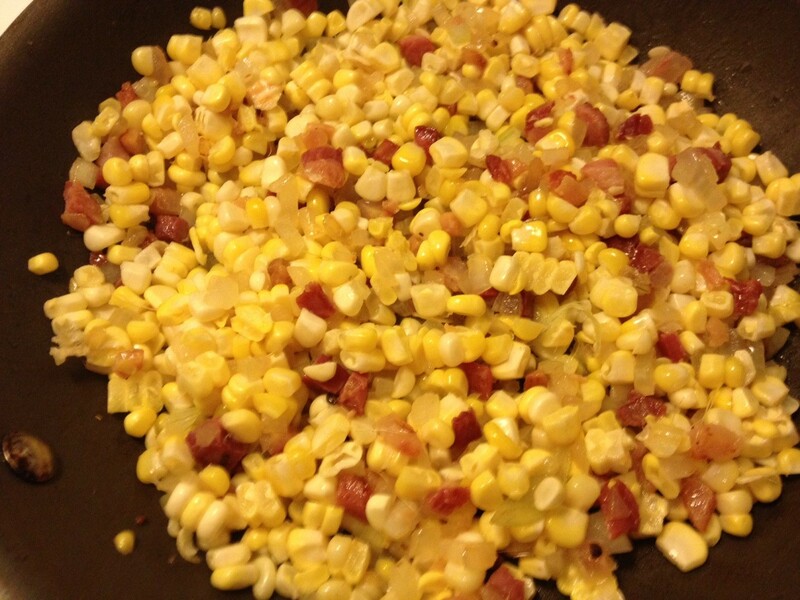 While the pancetta is cooking, cut the corn off the cob. 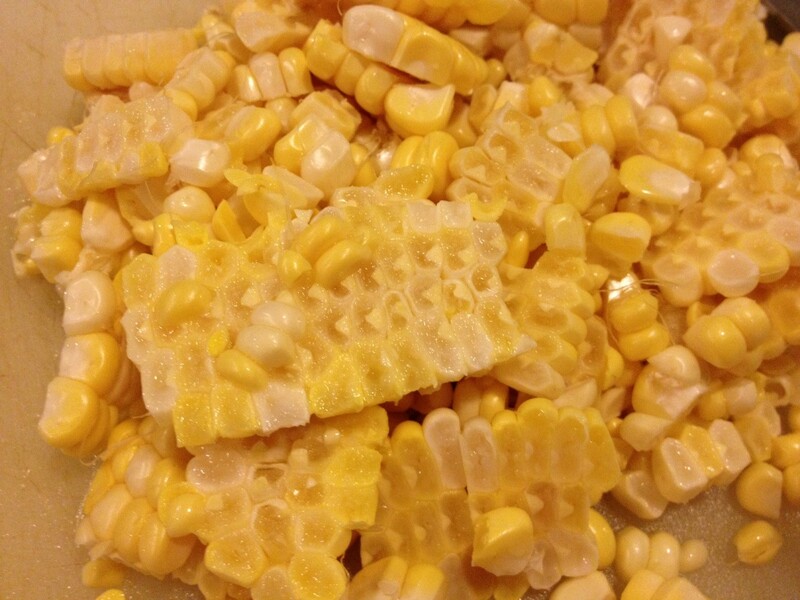 Tip: For an easy way to cut the corn off the cob, I like to cut my cobs in half. Then, place the corn cut-side down on the cutting board. This gives you a flat surface and helps keep the corn from moving while you cut the kernels off. Drain excess grease out of pancetta pan. Add onion and corn to pan. Cook for 5 minutes, or until onion is translucent and corn is cooked through. Pasta should be finished. Drain but be sure to reserve 1/2 cup of pasta water. Add pesto sauce, reserved pasta water and butter to cooked fettuccine. 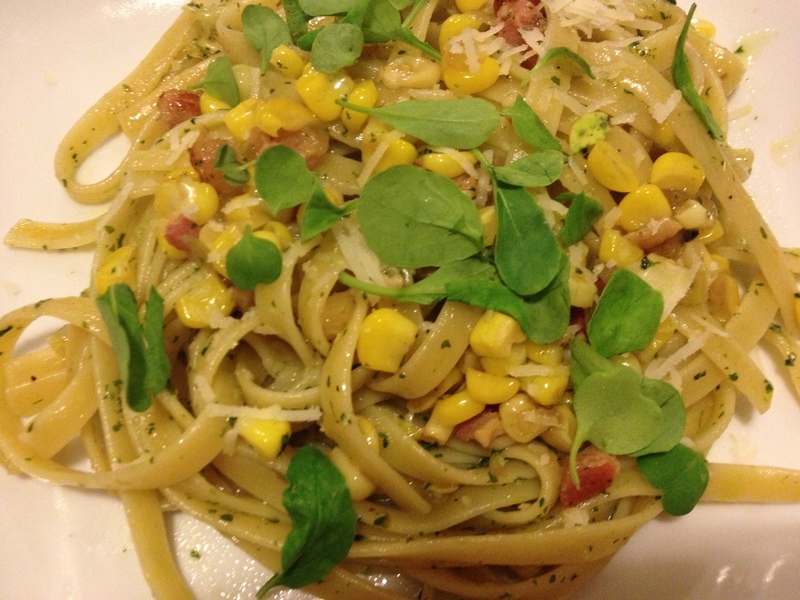 Add pasta to pancetta, onion and corn mixture. Mix everything together. 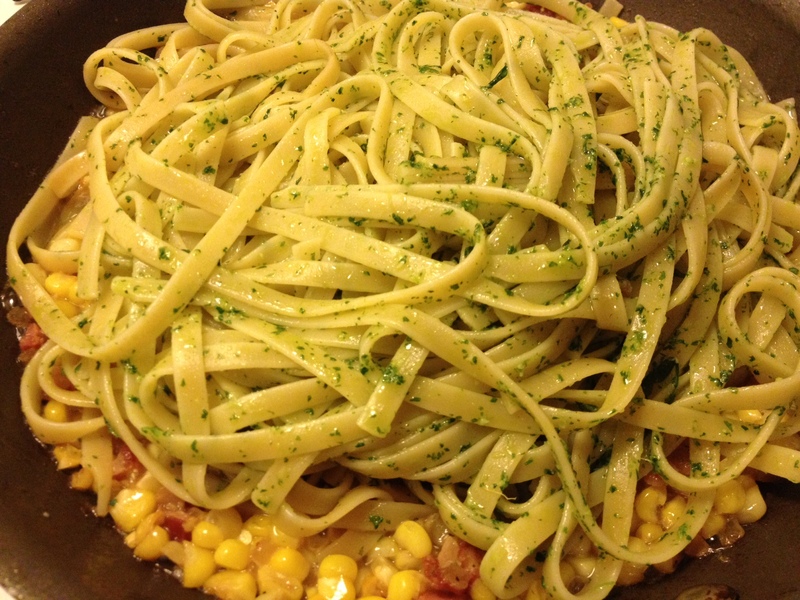 Pasta should yield 8 servings. Before you eat, be sure to add fresh arugula to each serving! 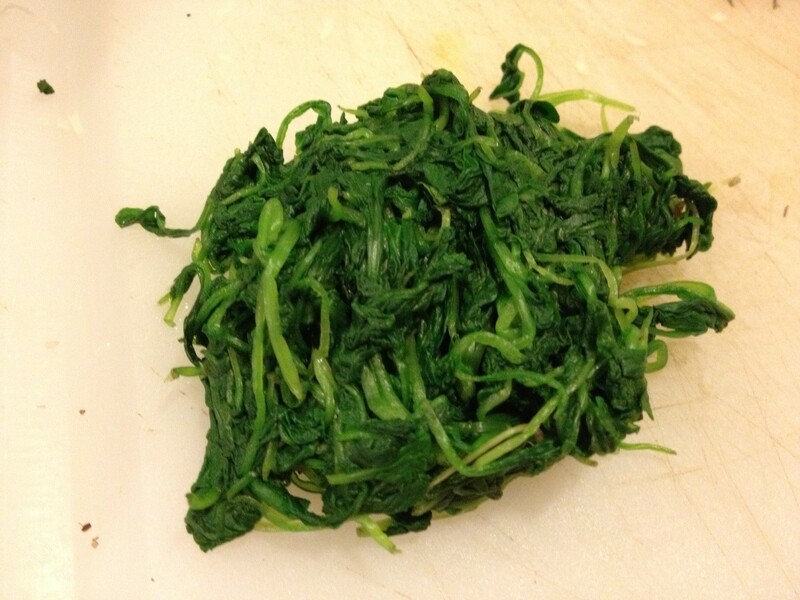 If reheating, don’t add fresh arugula until after the pasta is warmed up. Enjoy!